Killamarsh Secondary School U15s. 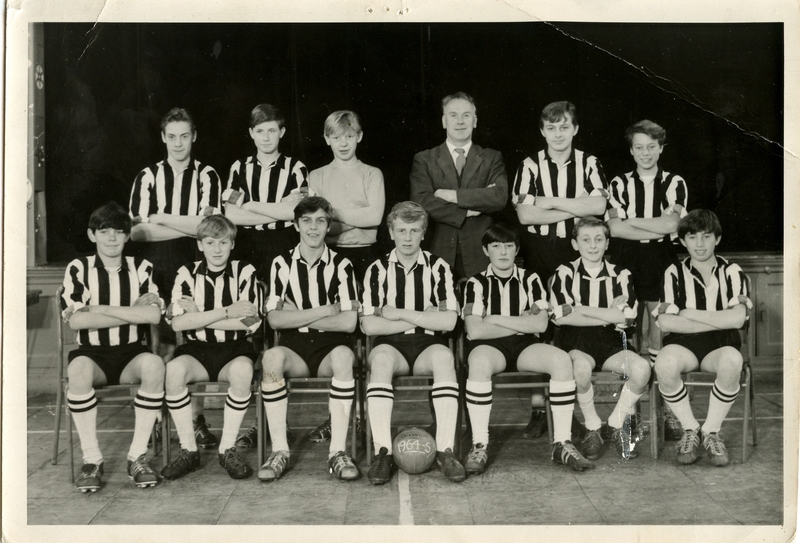 Roy Middleton on back row. Photo courtesy of Roy Middleton. I was always envy of your skill but perhaps more so, your bravery. All these years later I can still remember you scoring a flying header – you were horizontal heading the ball from a right wing cross at the top of the sloping field. Terrific goal … I hope you can remember it. Dont remember the goal at all Eric , scored loads of goals & only remember 2, diving header in the snow against Huddersfield & a 30 yd left foot volley into the roof of the net against Grimsby all at under 21 level. Anyway Eric you appear to be the guy whos keeping this site ticking over . One of our old teachers(Tom Sayer) once said you’ll always remember your school days & its true.What a weird feeling I had seeing all the old school photos I wanted to place myself back in time & be with the people as they were then.Its 52 yrs ago (a lifetime) some have probably passed away unfortunately,I know Alec Moore, George Longdon ,Brenda Limb & Michael Bright are no longer with us. Shirts – Black and white stripes. Socks – White with black hoops.